For me at least the first interior mod was to get a set of Lloyd's Lux mats. Tint, a very good radar detector, and a laser jammer, if legal where you drive. I know you didn't ask, but a simple and functional outside addition is splashguards. IMO carbon fiber cheapens the look. But to each their own. I agree with window tint and floor mat. But the one mod that I'm looking for, but haven't found, are better cup holders. Another mod, if done properly, is sound deadening, but it's not easy or simple. For me, besides a good radar detector install and a holder for your mobile phone, if it's a pre-16 car, the flat bottom steering wheel is a MUST! Makes it easier to enter and exit the car, looks good, and feels good. If you need better cup holders, you should be driving a Prius. The following users liked this post: Chip E.
Send a private message to Chip E.
Find More Posts by Chip E.
Originally Posted by Chip E.
I daily my car. Car and Coffee, one shouldn't have to live without the other. We have some of the best coffee shops in the country here in San Francisco. 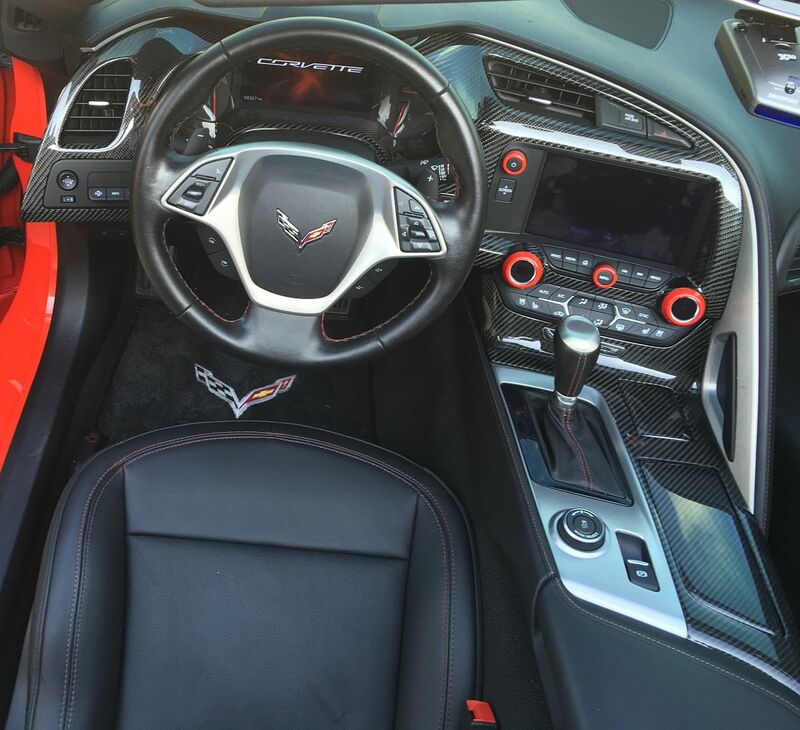 How could anything look cheaper than the flat black plastic that covers the dash and console? What color is your car? 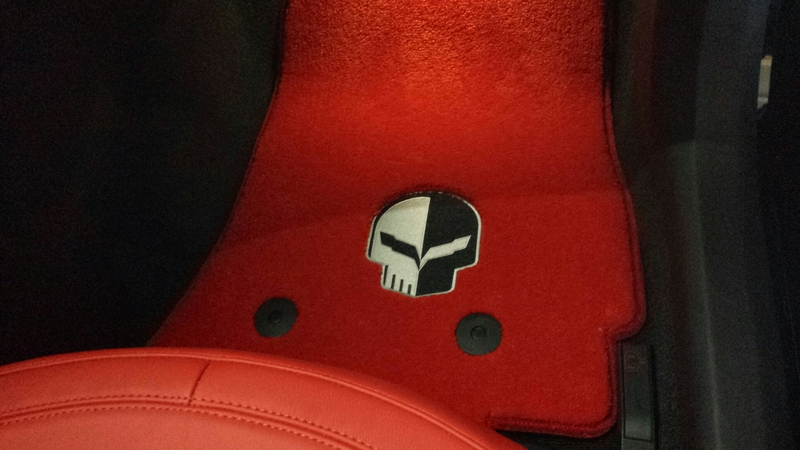 Sharpie to color the stitching really adds to the over all look and is the cheapest mod ever...under 2 bucks. 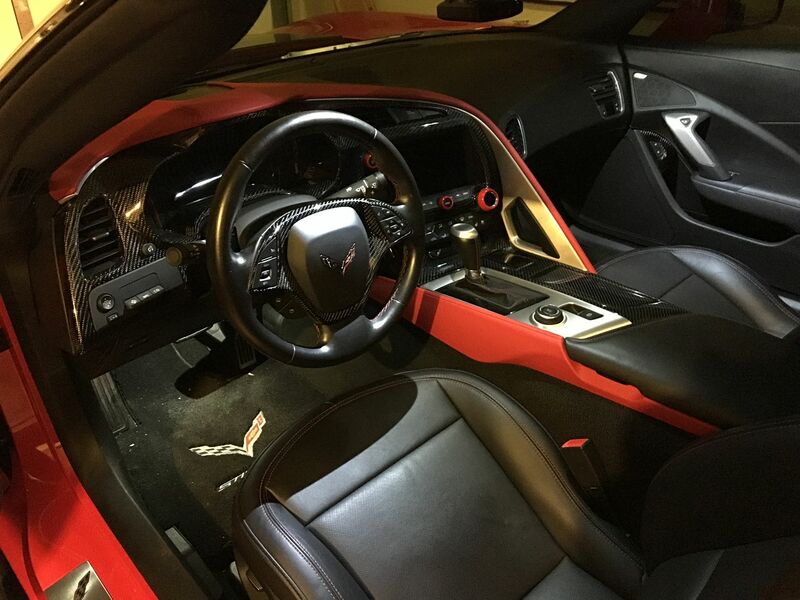 Lots of guys have done it and it makes a stellar difference in the appearance of the interior. 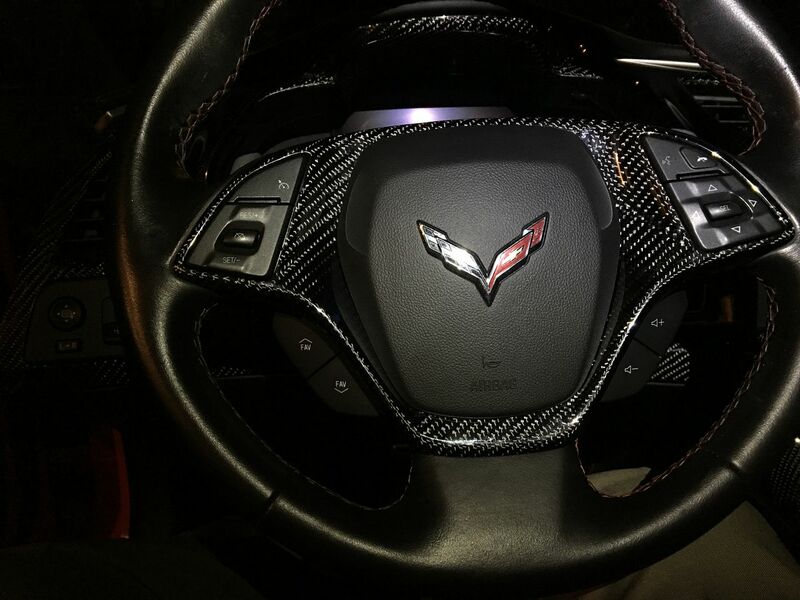 It was even picked up my GM, they are offering red or yellow stitching on the 3lt interior...they are learning from the "modders" who own Corvettes. What is most important is what you like. Side skirts and stone guards to keep the rockers looking good, lowering the car a bit....Oh yeah, and lots of decals. Last edited by W88fixer; 02-05-2016 at 09:47 AM. Agreed. The unsolicited opinions that constantly appear on these types of threads get old. Waiting for totally unsolicited and off-topic comments on lowering and chrome/black wheels next. Lloyd's mats with the Jake logo. I love that carbon! I would do that on my car too, but I've grown accustomed to the unpolished factory carbon. I believe they have an option for that as well, so that may find its way into my car in the future. Essentially, my plan is to replace everything that's Carbon Flash paint with real carbon fiber. I've had my 2015 for a year and a half. It is my DD. First thing I did when I brought it home was order a WeatherTech mat for the rear cargo. I often go to the grocery store, ABC store, and Home improvement store. 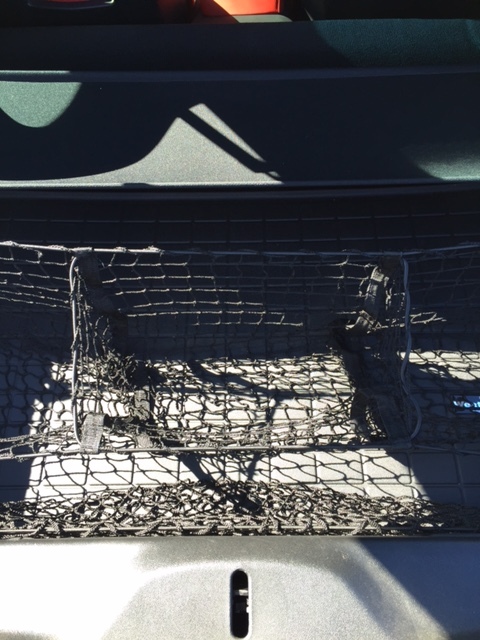 I got tired of my purchases coming out of their bags and flying around so I just bought this expanded cargo net from ebay. 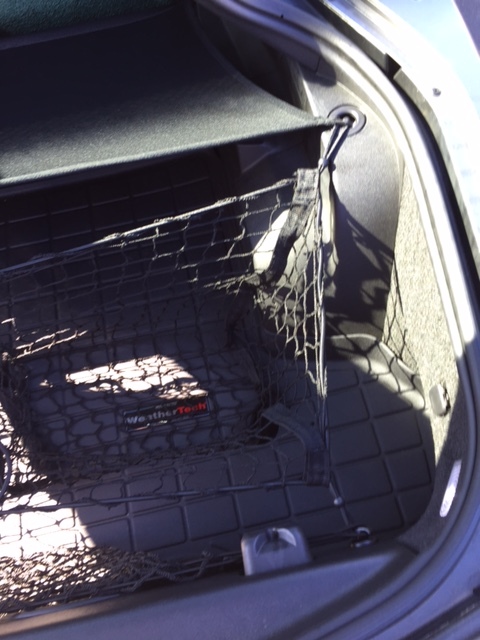 It fits a little tight between the back hook where the OEM cargo net goes and the rear sun shade. So far I have not broken any of the hook tabs and the bungee cord on the ends has stretched a little. Now my things don't go rolling around back there when I take a cure. How big is your service dog? Is it the size of a yellow lab? Last edited by fumbling; 02-05-2016 at 12:13 PM.